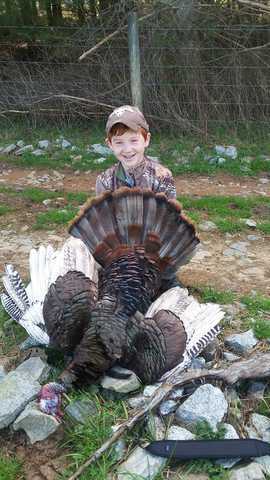 13 year old Branson Miller had no idea that the Opening Day of the 2016 NC Youth Turkey Season would be an opening day that he would never forget! 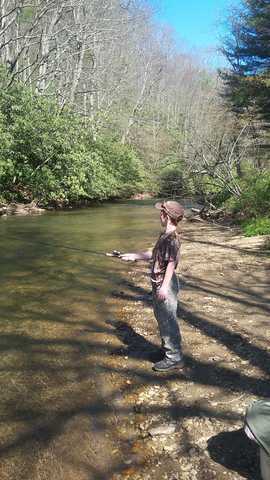 April 2, 2016 was the Opening Day of trout season in North Carolina as well as the Opening Day of the Youth Turkey season. For 13 year old Branson Miller the choice was an impossible one to make, so he done what any avid outdoor enthusiast would do! He choose both!!! Why not, it was his day. Now Branson is a little like his mother when it comes to organizing and planning out his day. Me on the other hand, I fly by the seat of my pants! However, there was NO amount of planning that would prepare us for what would later happen on opening day. The night before opening day Branson refreshed my memory for the thousandth time to the schedule of events for the next day, as if I'd forgotten the current weeks worth of briefings! After all the excitement and planning I could stand for one day, I convinced my son to finally get into the bed, as we would desperately need every minutes worth of sleep we could get because opening day was now just hours away! Just like clock work the alarms and cell phones went off signaling that it was time to rise and shine! For me, I staggered around the kitchen looking for a cup of black coffee. Branson on the other hand was running through the house bright eyed and bushy tailed, ready to roll! He had already loaded the truck and was waiting on dad, who was trying his best to wake up! Needless to say Branson had a great morning catching trout. He had turned the little ones loose and had more than enough keepers in his bag to grease a frying pan. True to Branson's nature he follows through on his schedule. Lunch at the little cafe beside "Jerry's Gas Station" and then it's only a jump, hop and a skip over to our lease in Alleghany county. Our lease actually joins my uncles property which is divided by a large creek. Our plan simple, drive to my uncles in hopes of spotting a bird in the field on our lease or on my uncles land. The wind had got up which was going to make it difficult to hear and calling would have to be loud in order to carry. Our best hope was to spot a bird in the field and make a move! As we approached my uncles house we spotted two toms on the other side of the creek in a field which meant we had to turn around and come in the back door of our lease. The birds were on a mission as it appeared they were heading somewhere. Time was of the essence and we had very little to spare. We parked the truck and moved up the hill. As we top the hill there is no birds in sight, yet! We have got to get set up, but where? We are standing at the top of an old Christmas tree field with no cover. 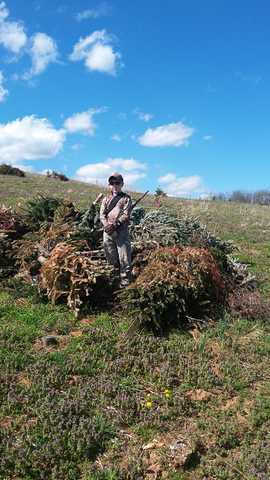 The only thing around us is some old piles of dead Christmas trees. We make a make shift blind out of Christmas trees and stick the decoys up right in front of us! I sounded off on my old box call, fighting against the strong gusts of mountain wind the call found its mark. Only 5 minutes after sitting down I spotted a white head at the bottom of the hill near the creek some 250 yards away. "Get ready, here he comes",..... I noticed no immediate reaction out of Branson so I repeated myself. "Dad, there is no turkey" he said in total disbelief. "Branson, there is a tom!" I yelled in my softest hunting voice. As Branson looked up he saw the tom as he is now at only 200 yards away going up the hill across from us. 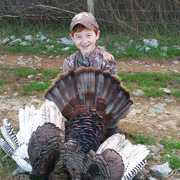 I once again hit the box call and he responded with a gobble. He now breaks away from the tree line and cuts across the middle of the field. He travels only 20 or 30 yards and freezes. He appears to be checking out our decoy set up. With the Cherokee Sports inflatable tom I'm not worried about appearance it's the wind I'm afraid of! We are praying "Dear Lord, please don't let the wind blow these decoys off this hill." I reach for my slate call and being to purr and yelp. That was the only conformation ol' Tom needed as he commenced on a 200 yard 'death march'! Awesome story, congrats Branson. Not a bad way to spend a Saturday! Great story, congratulations on the bird!